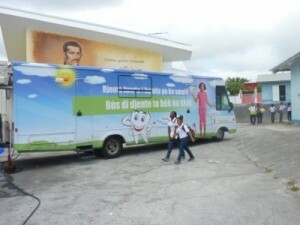 WILLEMSTAD - There will be more dentist busses in schools and neighborhoods. This was reported by the Minister of Public Health, Nature and Environment, Dr. Ben Whiteman. The 'Bus di Djente' has shown that 94 percent of clients that were treated had dental problems. The dentist bus provides free treatment and information about dental care. More than 30 percent of the treated students was referred to the dentist. It was also noted that a large part of the clients have not visited the dentist in years. Every week the bus is at another school district. In the morning, the schools are visited and in the afternoon the neighborhoods. It is not yet known when the government will acquire more of these busses.